Thought we'd give these oven tacos a try, something new. Actually the thought of having it half way assembled sounded pretty good, it's hard to fill a taco shell sometimes, especially little hands. This way the meat mixture and cheese is baked into the shell so spillage is eliminated. A bonus to these delicious tacos is the shell doesn't crack all over the place when eating either. I read in comments that some turned out soggy, but mine did not, I guess I let the meat mixture cook down a little more? The shells will be softer but not in a bad way. We loved them, the meat mixture was very good. I used all of this on 2 lbs of ground meat with a little water mixed in. What a great idea, I'm all for making things easier and this seems like it would save time just when I need it more. THanks! Yum, I love tacos and never thought of heating them up like this before. I usually only heat the shells. I tried this a couple of weeks ago and now this is the only way my husband/kids will eat tacos. You are a GENIUS. For serious. Thank you for posting!! I made these last night and they were great. The whole family gave them a thumbs up. The best part was they are so much less messy than regular tacos. Usually my kids spill taco meat on the stovetop filling their shells, then they get cheese all over the counter filling their shells. All that was eliminated and there was less waste on their plates. They are also more filling so my boys were stuffed. Thanks for the great idea. LOVED these!!! Thanks for the great recipe! Just finished making this. Absolutely delicious. Family loved these tacos! Thanks so much for sharing. If you switch it and put the cheese on the bottom then the meat on top, the cheese will help keep the taco shell from getting soggy. There is grease in cheese too. So that won't help. These tacos are delicious!! I made a half recipe and used lean ground beef...my husband ate them up! Thanks for sharing! Do you think using a regular/store bought Taco Seasoning would be as good? I have a large container of Taco Seasoning from Sams I would love to use. Just wondering if anyone tried this without using the Homemade Taco Seasoning. It's not like it would be hard to do, just curious. Wow these look so good!!! Thank you for sharing. It seems so simple and yet so delicious. What a balanced meal perfect for a busy weeknight. This sounds delicious. I usually make double decker tacos (a regular taco with a tortilla and queso wrapped around it) but the crunchy part of the taco gets really messy. I'll try making it this way next time. Just a thought about the tacos. Try taking aluminum foil and sort of scrunch it up and put on the bottom of the pan then put the tacos on top. That might help any soggy problems. I made these tonight for my hubby. He loved them! I highly recommend this dish. I did not add all the spices. I used about l/4 of it and saved the rest. It all depends on how hot you want it. These are seriously delicious!!! Would it be wrong to eat the entire tray myself??? Omg!! I made these tonight and they were a complete success. Very yummy! Thanks for sharing. :0) I will definitely be making these again. Hi Cindy, that sounds wonderful! I bet you could use either corn or flour tortillas, your favorite enchilada/cheese sauce and bake them off. I've used it on nachos too. Sounds good to me! Growing up we always heated our shells with the meat in them... now I don't, because that seemed strange. Funny how those things work sometimes! I'm definitely making the baked tacos for my son! looks great! I have been fixing these forever for my family. I use storebought seasoning in the ground beef and no sauce. Layer the shells with refried beans out of the can, then a layer of meat, then cheese. I used to bake them but now put them in the microwave until the cheese melts. Crispy and warm. Add lettuce, sour cream and sauce and enjoy. you are going to love this! i accidentally made fat free refried beans. i was cooking a pot of beans with onions and garlic, salt and pepper. as the beans kept cooking down, i would add more water and suddenly they turned to mush...thick mush and they were GREAT! i sort of got the idea from the english "mushy peas". Not only are the tacos fantastic, but your seasoning mix is a keeper! We just finished supper and these are a new favorite!! They were yummy! I made these tonight. They were very good. I used the taco seasoning from Trader Joe's and ground turkey. I will definitely try out the homemade taco seasoning next time. I have made these about 4 times now, with your taco seasoning recipe! They are AMAZING!!! Thank you! I made these tonight for my family and they were amazing! Such an ingenious idea for making tacos! Our 4 year old and 20 month old both loved them, as well did my hubby! Thank you for such a great and easy recipe! Hello Mrs. Rigoni, The sauce is not spicy at all. Well depending on hot hot you make the taco seasoning (if homemade). My little ones eat it just fine. If you want spice, feel free to add some. Made these tonight and they were a hit~utterly delicious!!! My family loved these! There wasn't anything left! I made two changes, I used flat bottom taco shells and substituted black beans for the refried beans. This will be a new favorite I think. Hi Hannah, I often eat dinner leftovers for my lunch the next day and I have found with these yes they will be soft. You could save some meat mixture aside and make it up as leftovers, baking what you need. These were absolutely delicious. thanks for the brilliant recipe. These look so good! My family doesn't care too much for refried beans so do you think I they would come out ok without if I leave them out? Hi Tamara, I would try the recipe with them, they really combine well with everything so it's not like eating them straight up. I'm not sure how it'd turn out if you left them out, probably be a runny meat sauce and may make them soggy. I wonder if adding an extra 1/4-1/2 pound of meat would work instead of beans? I made them tonight without the beans and they came out great! They weren't soggy and I didn't add any more meat.Though I will try them next time exactly as written because the reviews say how amazing they are! Thanks for the new recipe! We always use soft flour tortillas. Has anyone tried the recipe that way? Made these tonight & they were a hit! Thank you for sharing this recipe, it's a keeper. Love this recipe. I have made them twice. First time I followed exactly, making the seasoning as instructed. Next time I tried it with package taco seasoning. Bad Idea. The whole family turned their noses up, thumbs down. So...follow the recipe and you will love it. Thanks for the recipe. These are great! This is the only way I make tacos now; I don't always use hard shells, I often make tortilla shells and just do not put them in the oven. Love the seasoning recipe!!!! I haven't tried these yet - but plan on it. It will make it easier for my husbs nd & I to both get hot tacos. I wanted to suggest using jimmy dean sausage instead of hamburger or a mix of both. I started doing this & the tacos are so much more flavorable!!! Found you on Pinterst and just spent 15 minutes scrolling through all your recipes. Can't wait to try tacos, baked pancakes and enchiladas! Tried this tonite and yum!!! I did use a can of tomatoes and green chili instead of tomato sauce. The little delights came out wonderful! Thanks so much! I now have a new quick recipe to add to my weekly meal plan. And Sargento's Mexican blend added a wonderful gooey yumminess that complimented the slight crisp of the shells. Oh and I put cheese on the bottom before adding taco filling and then more on top. Mmmm. Sounds good. I am going to try to make them clean eating. They sound great. So excited to try these tonight. I am constantly looking for easy gluten free recipes (my son and husband have celiac). I just started my own gluten free blog for fun. I honestly have no idea HOW this is the first time I've seen someone do this. Brilliant! We tried this tonight with vegetable filling and cheese. They came out amazing, I am thinking I can just reheat the leftovers the same way? Thanks for the amazing idea!! Thanks for this recipe! It was easy to make and my husband absolutely loved it! Made these tonight for the first time, and my family of 6 really loved them!!! I am going to try them as chicken tacos next. I linked my blog readers to you tonight. I hope that was fine. :) Thanks! Made these for dinner tonight. They were so good, even my 7 year old picky son gobbled them up. The taco seasoning was incredible, I'll never buy store bought again! I did make them without the beans though. They weren't soggy at all, but I did line the casserole dish with foil, so don't know if that helped or not. Will definitely be making these again! just took them out of the oven and they smell divine! can't wait to eat, this will definitely be my new way to make tacos. thank you for the recipe! Great idea and great recipe! My family loved them. No more taco seasoning packets for me! Made these tonight for my family, I had no problems with them getting soggy. Well, the bottom did get a little soft by the time I had my 3rd taco, but the rest of the shell was so crispy that it made up for it. My husband loved them, I think he at 4 and my girls (4 and 2) liked them a lot too! Will definitely be making these again! 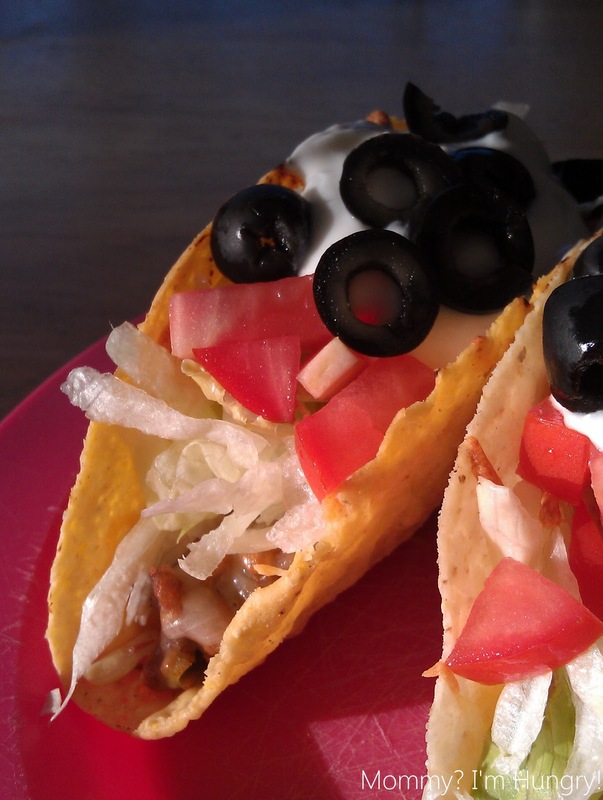 I made these for dinner tonight and I'll never make tacos the old-fashioned way again. They were the perfect combination of melted-cheese goodness with just the right crispness! I made these tonight and they were so good!!! We may never go out to another Mexican place again. This was wonderful, truly tasty! My daughter doesn't really care for beans but she didn't seem to notice them in the meat. Genius idea to heat the shells with meat and cheese in place. Thanks! These are AMAZING!!!! My fam has requested them several times over the last few weeks. Super easy, super fantastic! Made several dishes when had 18 family members over. So great to be able to eat all together & 'dress' em up like we wanted. Thank you! made these tonight and they are delicious! Thank you for sharing!!! Made this last night and loved them. My husband doesn't like beans but even he liked them. :) And honestly, I don't know why I never thought to bake them in the oven before. Keeps everything inside making it easy for my 2 and 4 year old to eat. Thank you! Yup. These were SO delish. And I 'mocked' the recipe because I didn't have everything. no green chiles, just threw in frozen onion and green pepper, no tomato sauce, just sprinkled a little salsa, threw in some leftover pintos from the fridge. SUPER DUPER YUM!! I did have all the seasonings though. I can't wait to make these again and actually follow the recipe and a have more toppings !! Thanks. OMG, I just made these yesterday.They are terrific. The only thing I did is I added chorizo. I cooked it separately so not to add extra oil to meat mixture. After I cook the chorizo I added it to the beef mixture. To die for. I will never buy taco mix in a pkg. again. Your homemade taco mix is fantastic. This looks amazing! It seems like an easy recipe for moms to put together. Thank you for posting this recipe. Mmmmmmm. It was delicious. I changed a few things but Mmmmmmmmmm. Thanks! Thanks for this recipe! Everyone here loves it! I know my husband will be super happy once I make these, he is not a fan of messy foods and is constantly complaining about it lol Thank you so much for this! These were a total hit! My 5 year old asked me to make them again tomorrow after his first bite. What a great idea!! Another delicious recipe!! LOVE these and will be making them again. I think the meat mixture would be great in enchiladas too! Hi Elisha, it is called Coming Soon, I use it from blogger's editing section. I tried your recipe for Oven Tacos tonight, and YUM! Mine didn't turn out soggy at all. I didn't have an tomato sauce, so I used tomato paste with a little bit of water. I also made sure to drain the ground beef of all fat, as well as drain the juices from the canned green chili's. Turned out perfect! Sure made a lot of filling, I'll be eating this for lunch tomorrow. Thanks for sharing your recipe! I made these tacos a couple of weeks ago and they were a HUGE hit! My boyfriend and I loved them. Very filling and the taco shells were done perfectly. Thanks for the amazing recipe. We like our taco seasoning a little on the spicy side. How would you rate the heat in your seasoning mix with 1 being "mild" and 10 being "hot"? What kind of 1 (8 ounce) can low sodium tomato sauce do you recommend using?? Thanks!! What a nice recipe. I am going to my kitchen trying to prepare this. I like your idea. I never try this recipe like this way. Hope this will be more better. Thanks for your recipe. Absolutely loved these Tacos!!! I used Chorizo instead of ground beef and they were delicious! These were very good, and filling. Made them for dinner (made only 7, not 18!!) and froze the rest of the filling for a future meal. The meat/bean combo would be good as a nacho base, too. Loved this recipe! Even my anti taco kid said these were the best! I did make a couple of changes; I used Mexican style tomatoes instead of tomato sauce and green chilis and I didn't have colby jack so I used cheddar instead. But everything else what awesome! These tacos were wonderful. I'll never do them individually again. I cheated and used pre-made taco mix and added 1/2 cup water to the mix. Thanks so much for sharing. I'm passing this on to my kids. I love these tacos but i do have a question! I am having some friends over for dinner. I was curious if it would taste the same if I cooked the meat this morning and baked the tacos separately this evening or do you think I need to do it all at the same time? Thanks! Hi Nikki, sorry I missed your question and I hope they came out great! I would say yes you can make the filling separately and add it to the shells just before baking. These sound good but how in the world do these not get soggy while they are baking? These tacos were delicious. Try stand and stuff taco shells...no problem with shells falling over. Share your thoughts, ideas or just say Hello, as long as it is family friendly and Spam free! *Have a question you need answered? You can either contact me on my Facebook page, email me directly: Ldylvbgr(AT)Hotmail.com or check the box for *Email follow-up comments* and I'll reply to your question in the blog post.